CAREER HAS BEEN UPDATED to current patch status. So for my first MTS upload I chose a custom career of mine I'm rather partial to. 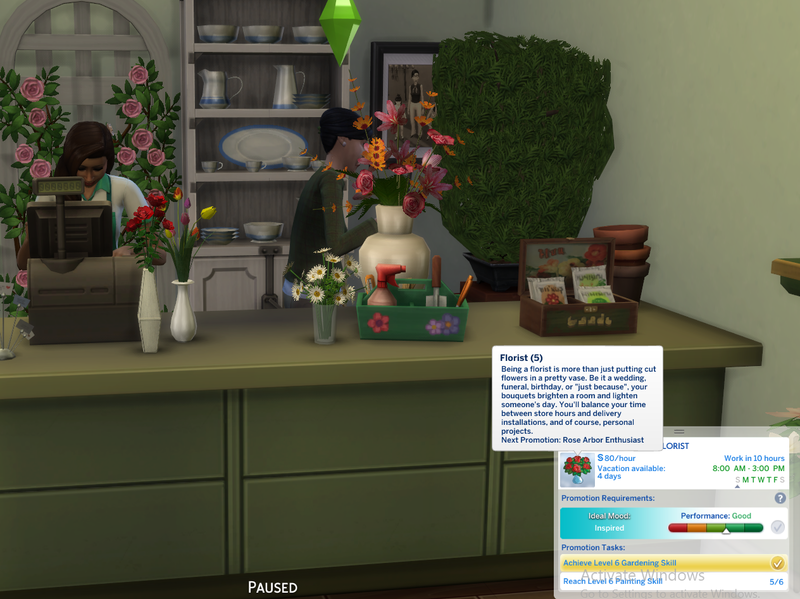 I always enjoyed flower arranging in TS2, and I hope it makes a return someday. Until then, here is my Florist career! Do you love flowers? It's not enough to be passionate in this industry; you need talent, knowledge, and a knack for communication. Work your way up the corporate trellis, floral shears in hand! Should be Base-Game only. No other packs needed. NOTE: To Install PTO, please do the following: Place the .py file into a separate folder marked "Scripts" inside your florist career folder. Thank you. Okay, so maybe "specialist" is taking it too far... You've got a van at your disposal and every now and then the boss pays for your gas. Get those bouquets to their destinations on time, and intact. You're working "in house" now, answering the phone and working the register. Other duties include dusting vases, sweeping the floors, accepting early deliveries, and unpacking boxes of ribbon. You're currently training under the mossy green thumb of your boss' elderly mother, who used to run the place. Learn how to properly grow and cut flowers, and keep note of what is in season and when; there is a reason tulips are most expensive in summer! Being a florist is more than just putting cut flowers in a pretty vase. Be it a wedding, funeral, birthday, or "just because", your bouquets brighten a room and lighten someone's day. You'll balance your time between store hours and delivery installations, and of course, personal projects. You attend garden shows for a living and submit your best roses for a chance at first prize. Those judges are snooty; remember there is a difference between a John F Kennedy and a White O'Hara, and don't even get me started on grandifloras! Flower growers across the county dream of the day their garden glories win a perfect score from you. Approach each entry and judge with haughty pride, for with every "har-hum", "mm-hmm", and "huh-huum" you mutter their entrants tremble with fear. Tremble, I say! This is it! Off on your own and running a successful florist. 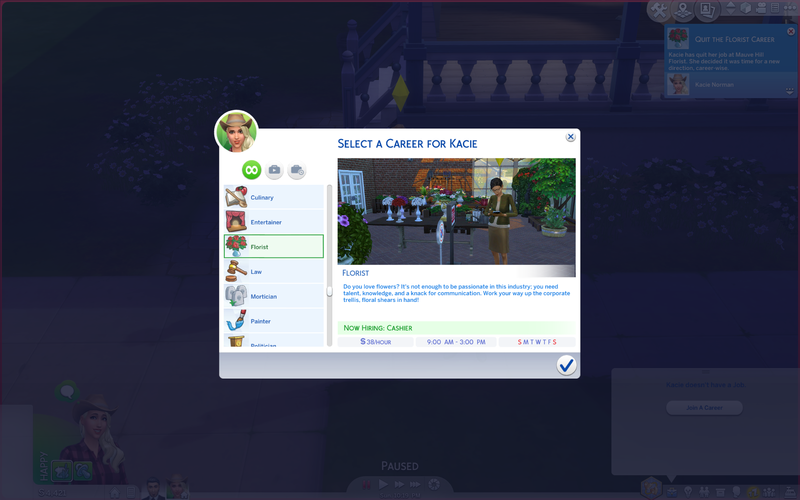 From here on in you call the shots; that means placing orders and balancing finances, working with nurseries, and crafting only the most expensive of designs! As any florist will tell you, no one attends a wedding for the chicken; they go for the flowers! Brides are scary, and have a nasty habit of changing their minds on a whim. Make their special day something to remember, and for heavens' sake don't put monkshood in the bridal bouquet! Your arrangements can be seen in the homes of the rich and uber famous. The Mayor has requested your services to decorate for his Winter Jamboree, and there's even rumor of your own TV show. Bask in the sunlight of your floral empire, you're a rose among the wildflowers! Please do not re-upload, edit, or claim as your own. Florist Interior/Characters are my creations. Please do not upload/use as your own.